… that yield the greatest gain for card counters? The analysis and discussion that presented the above conclusions can also be found in Donald Schlesinger’s book Blackjack Attack, which was first published in 1997. This book includes some of the most important technical insights into the game of blackjack ever published. 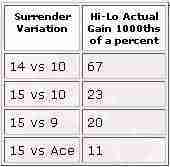 Play variations (variations you make from basic strategy) are what card counting index numbers are all about. They can be very important in single deck and become less important as decks are added to the game. Each card counting system assigns unique index numbers for these plays. For example, in the Hi-Lo system the Insurance index for a 6-deck game is 3.0. This means that the player’s best technical move is to take insurance if the “true” count is 3 or higher. If the player has a 16 versus a dealer 10 the Hi-Lo index number is 0. This means that the player should “stand” if the count is greater than or equal to 0 and “hit” otherwise. Although these top play variations are technically correct you may have difficulty implementing some of the plays from a camouflage point-of-view. For example, the casino pit will often watch players who correctly take insurance on bad hands and decline insurance on good hands. Splitting ten valued cards is another give-away that you may be counting cards. The saying is that only two types of players split tens — idiots and card counters. If you don’t look like an idiot at the table they may just suspect that you are counting cards. Many counters have given up splitting tens for this very reason. However, insurance is too valuable a play variation to ignore. If you need to mix-up your play I would suggest you consider taking even money on small bets occasionally when the count does not justify it. When you are ready to add more play variations to your repertoire you may want to consult Peter Griffin’s book, The Theory of Blackjack and the article “The Most Important Plays in Blackjack” published in the Summer 1992 issue of Blackjack Review. 1. ↑ The gains cited are associated with a player spreading bets from 1 to two hands of 6. These are the average gains for flat betting multiplied by the average bet one has out when he makes the departure.